DISCLAIMER: Information is believed current at press time but conditions can change quickly. Check ahead. No endorsement of any campground or product is implied by this reporter nor this website. 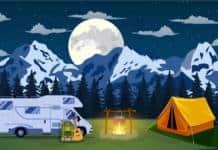 Opening dates for state campgrounds in New York on average is mid-May but at least one opens as early as April 5 and others open as late as June 28. Note too that some sites open only on weekends during “shoulder” periods in spring and fall. Closing days range from September 2 to late October, depending on locale. Fees range from $18 to $28 plus $5 additional for non-New York residents. Check individual campgrounds. Verde Ranch in Cottonwood, Arizona, is now taking reservations at 877-570-2267 for its opening in late summer. Located one hour from Sedona and 1 ½ hours from Phoenix, this full-service RV resort has 402 sites and 16 resort cabins. (Think family reunion, with accommodations for those who don’t own an RV.) Explore nature sites and go ziplining nearby, kayak the Verde Valley River and take a “safari” at Africa Wildlife Park. Greenville Campground at Wappapello Lake and all of his massive trees were completely destroyed in a 2017 storm. Recovery is on the way. To date 70 campsites out of 107 are ready with new concrete pads. New are 50-amp pedestals, 27 sewer lift stations, wider roads and parking, water lines and much more, thanks to the U.S. Army Corps of Engineers. The day-use area remains open. To ask about an opening date for the RV sites contact 573-222-8562.. The park’s Chinquapin Hill Campground opens newly renovated for the 2019 season with three rebuilt bathrooms and 18 new, full-service campsites. Six old shower houses were removed. Phase two of the park’s rehab will mean similar work at the park’s Hosack Run campground starting this year. That project should be finished by Labor Day. For information about Pennsylvania’s state parks call 888-PA-PARKS, 727-2757. The new cancellation policy for all Yellowstone reservations calls for a 7-day notice and an increase in the cancellation fee to $25 for each change made within 30 days of arrival. Fishing Bridge RV Park is closed for the summer 2019 season. Now open and taking reservations is the newly renovated West Lakeshore Loop campground at Wilderness State Park, Michigan. Now accommodating larger RVs, the park has reduced the number of sites and added new water and electric lines, two new wells and improved roads. Make a Michigan state park reservation. Whistlers Campground was built years back to serve another era in camping. So they decided to shut down for the entire 2019 season to do a stem-to-stern renovation to accommodate today’s campers and larger RV’s. Added will be 17 new washroom and shower facilities throughout the campground. Parks Canada said campers will not have to walk more than 250 metres to use them. DENALI NATIONAL PARK AND PRESERVE IN ALASKA will open its six campgrounds for the season on May 12. The park is open all year but campgrounds will close again in mid-September. Don’t miss the nightly musicals at the Miner’s Plaza. NATIONAL PARK POSTERS in the art style of the 1930’s WPA era have been created in a limited edition series by artist Rob Decker. Decker studied under Ansel Adams at Yosemite and has been interpreting the national parks with his art for 50 years. Prints are signed, numbered and printed on recycled paper stock with soy-based inks. When he’s finished he expects to have all 61 parks in his collection. See the works. 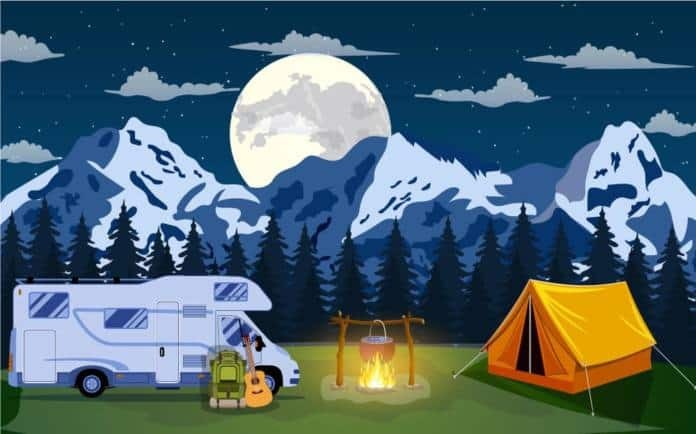 RV campsites at Flowing Lake Park near Snohomish, Wash., about an hour drive from Seattle, are now available for the season. The park near U.S. 2 has added 10 new sites this year to bring the total to 40, most with water and electricity. There is no dump station. The park includes a lake with trout fishing and picnic area. Learn more or make a reservation. Janet Groene is the author of 25 books including Living Aboard Your RV, 4th Edition. Please send us your campground news. Just fill out the form. Please enter your email, so we can follow up with you if necessary. “Parks Canada said campers…” Parks Canada cannot say anything. A spokesperson for Parks Canada can. Carp Lake is a virtually non-existent community near Wilderness State Park. Probably a township. There is no Carp Lake in Wilderness State Park. Nearly all campsites are adjacent to a Lake Michigan beach. There is a Carp Lake east of I-75 south of Mackinaw City which is near Mackinac Island. 3. “Greenville Campground at Wappapello Lake and all of his massive trees were …” His? Please watch your grammar and syntax. You are a guardian of the english language. I’m sorry to say it but I’m with Sheridan. Bill, I too find it hard to tolerate the sloppiness of today’s “speech”. It especially surprises me the constant mis-use of “bring/take” and “done/finished”. But maybe to be “a mannerly person”, you should consider communicating “all” of your error issues privately to the writer. Otherwise you appear grumpy and picky.